Uma’al was a hunter amongst the People. So abundant was the game that the hunters need only step outside their lodges and there would be deer, fowl, boars and hares everywhere. So plentiful was the game that the hunters of the village grew lazy, killing whenever they chose, taking only the best portions of meat for their feasting, leaving the rest to rot. So lazy had they become that the hunters of the People no longer asked permission of the Earth, nor of the animals they were to hunt, for the life of their brothers. This enraged Ots’o, Mother-of-the-Game-Animals, She who is the Great Mother Bear. Her children were being slaughtered without regard or appreciation. In her sorrowful anger Ots’o called all her children back into herself. Into her den she went, there high up on the escarpment of the mountain. Backing herself into her den, Ots’o opened her great maw and called her children, the game animals, home. From all directions of the land they came. Out of the North came geese, ducks and all manner of birds. The great stag led his noble kind from the East, while hares prolific came of their Southern lands and boars with their sows and rutlings from the West did come. From marsh and mountain, valley and plain the game animals across the land heeded the call of their Great Mother and returned to the Womb of Becoming. Where once the hunting of game was easy, now was it difficult. No more were the deer to be found outside the lodges of the village. Nowhere did the geese flock overhead. No more did sling or arrow cause the four-footed ones to fall, for there were none to be found. The People became hungry. The children were starving, their bellies as empty as the sky of stars after dawn. Drawn by hunger the hunters went farther and farther in search of food. Uma’al was a hunter amongst the People. His village hungry, his children starving, Uma’al wandered in a daze looking for something, anything to feed his family. It was in this condition that Chi’, the Raven, found Uma’al, roaming the vast reaches of the mountains at the center of the world. Recognizing the hunter as the one who bore the name of his brother Uma’al, the Red Wolf, Chi’ flew forthwith to Uma’al the Red Wolf and told him of the state of his brother, Uma’al the hunter from the People. Red Wolf then directed Raven to go in search of the game and tell Uma’al the hunter in which direction the animals were to be found. Raven flew about and spotted the game animals all moving up the trail of the escarpment to the Bear’s lair. Flying then back to Uma’al, Raven told the hunter the direction in which the game animals could be found. Being Raven, he told Uma’al only this, as instructed by Red Wolf, and nothing more. In that direction up the ridge Uma’al went. Dizzy with hunger he stumbled around up there. It was then that Ots’o smelled that man. Out of her den she came. “WHAT ARE YOU DOING HERE?! !” She growled at him. “Oh, Great Mother Bear, my children are starving and I am but looking for some game with which I might feed them,” Uma’al responds. “Then follow me and I will take you to the game,” that she-bear tells him. Up the trail Ots’o runs, climbs into her den, turns around and opens her mouth. Uma’al, staggering after her, finally gets to the top of the ridge and walks into the open maw of the Great Mother Bear. Once he is inside, Ots’o closes her mouth, sealing the hunter in her belly with all the game animals. 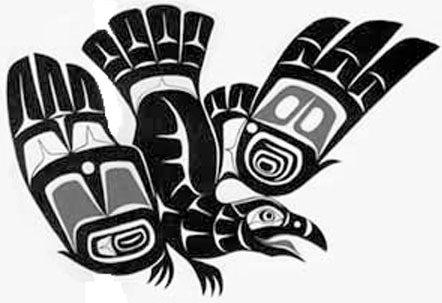 Raven, seeing what has happened, flies off to tell Red Wolf what has become of his brother, Uma’al the hunter. Red Wolf devises a plan and sets Raven forth to carry out the rescue of the hunter. Ots’o, seeing nothing wrong in this, agrees. As Raven sends in the rocks and water he gives directions to Uma’al, as he has been instructed by Red Wolf. When Raven has withdrawn, Ots’o closes her mouth. Then the hunter does as he has been told and pours the water upon the hot rocks. “Oh, you know how clumsy those humans are. I am sure he has spilled his water and now not only is he still cold and thirsty, but wet as well. Do you mind if I send him in some more rocks and water that he might be comforted?” Raven requests. Seeing nothing wrong with this, Ots’o once again agrees. This time as Raven passes in the hot rocks and cold water he tells Uma’al to place sweet smelling flowers on the hot rocks before pouring the water over them. Uma’al follows these instructions, and again a billow of steam pours forth from inside the Bear’s belly. “AAWHRRG! What is happening in there?” She bellows. Ots’o gives her permission and opens her great jaws for Raven to pass in more rocks and water. Now Raven tells Uma’al to howl like a she-wolf for her mate as the water is spilled upon the pile of rocks. The hunter follows the command given him and Ots’o roars with the abundance of hot steam and noise pouring forth from within her. Raven again convinces the Great Mother Bear that all is well and to let him again care for the human’s needs. As Raven passes in the last of the heated rocks and all of the cold water, he also passes on to the hunter the final set of instructions from Red Wolf to his brother Uma’al. He tells Uma’al to pour all the remaining water upon the whole pile of fire-heated rocks and to sing forth a song of appreciation. It is done. “AAWRRGHA-HU!-HU!” Ots’o bellows a great roar forth as the dense cloud of steam bursts out from her insides. With the Bear’s mouth still open in her roar, Uma’al gathers together all the game animals from inside her and rushes out into the world. Ots’o, realizing she has been tricked by Raven, cries: “Oh, you hunter, I have been deceived and now you are free, and my children once again roam the world. But, oh! What is to become of my children? Your hunters will slaughter them as before. Oh! What will befall my children? And so I, Uma’al, of the People, have done.